The event was organized under the patronage of Minister of Justice and Awqaf and Islamic Affairs of Kuwait Dr Fahad Mohamed Mohsen Al-Afasi. Speaking on behalf of the Minister, Mohammed Nasser Al Mutairi, Assistant Undersecretary for foreign relations and media, Ministry of Awkaf & Islamic Affairs emphasized that government of Kuwait and Ameer of Kuwait always gave importance to cultural exchange between various communities. He said that patronage of ministry for this program is also to promote cultural exchange and to convey the message that all human beings are one though they may be different in their respective culture. Quoting the verse from Quran he said that most pious person amongst people is most respected in the sight of God. 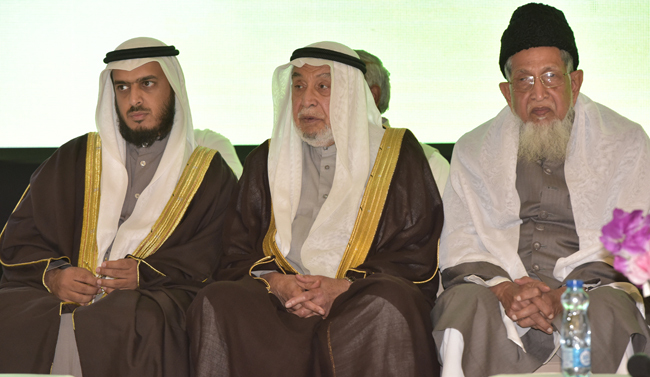 Khalid Mazhkoor Al-Muzkoor Chariman of Al-Islah Centre in his brief address said that Indians and particularly Indian Muslims constitute most important segment of expatriate community in Kuwait. Contribution of Indian Muslims towards the development of global Muslim community is very significant be it in the field of literature, journalism, religious education or any other fields. He said he is proud that ministry of Awkaf is patronaging the activities of various communities in Kuwait particularly Indians. Ex MP Naser Al Sane in his address mentioned about historical indo kuwait relationship, business partnership and appreciated IMA for its constructive activities in Kuwait. Head of the communities’ division from ministry of Awkaf and Islamic Affairs Khalid Abdurrahman Al Sinan in his remarks assured continued support and recognition of Indian community in kuwait. Main attraction of the function was octogenarian Indian Scholar, Vice president of Muslim Personal Board and an acclaimed community leader Jalaluddin Umari. In his key note address on the subject “Prophet Mohammad a mercy to mankind’ he emphasized the humanitarian teachings of prophet Mohammad related to oneness of God and oneness of human race. He said glorious teaching of prophet Mohammad (pbuh) stressing morality, human harmony etc are more relevant teachings to address modern day challenges. Another visiting scholar Dr Javed Mukkaram an organic chemist by profession and training and well known speaker emphasized that great teachings advocated by prophet Muhammad such as adopting perfection, hard work, broader vision are very important qualities for any communities to prosper in this world. He urged people to shun mediocracy and look for higher goals and achievements in life. Grand Seerah conference also included parallel session for professionals, women, children, Islamic scholars. Food Mela and Seerah Expo was also among the attractions of the program. Dr. Amir Ahmad addressed the professionals on the subject of stress management whereas Sameena Afshan addressed women on the subject of role of women in the reconstruction of the society. In Seerah Expo many children presented their creative artifacts. A multicolor souvenir comprised of informative articles was also released during the conference. Mementos were presented to Arab dignitaries by PR in charge of IMA, Iqbal Ahmad and Rafat Ali. IMA President Masood Shihab welcomed the gathering. Vice President of IMA Sharafuddin Soofi conducted the gathering which started with recitation of Quran by Waleed Umari. Many Kuwaiti and expatriate dignitaries, visiting scholars from India and thousands of families gathered in large number and benefited from the occasion and created an important milestone in the history of Indian community in Kuwait.